“We all live in a yellow submarine,” say The Beatles, “and our friends are all onboard.” The sun coming out in the real world is a beautiful thing but, perversely, I always shudder a little at seeing the Sun card. Why is this? Xanthophobia. The name of the phobia related to the fear of that color is Xanthophobia, and I have it in majors. My friends all think this is crazy, and I couldn’t agree with them more. Nevertheless, they know not to mention the name of the color, and to change their y-colored shirts before they come visiting, and yet they still love me. The color of the Sun card may be very flaxen, but sunlight isn’t really. We know this because when raindrops shatter the sun’s rays we can see in the resultant arc all of the colors split apart, into red, orange, that color, green, blue, indigo, and violet (from the outside in.) Together they make a light said to be “white” but as an artist I have to admit we don’t really perceive highlights as white. I express it as “have to” because my grandmother taught me to paint white highlights as a young child. My painting instructors have fought with me about it ever since, quite rightly. 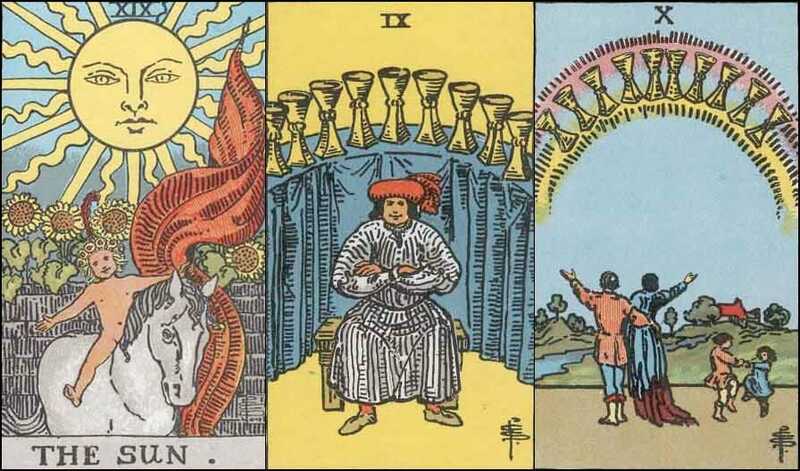 All of the cups cards are splattered with the despised color, which is unfortunate since I have such a strong affinity with water, even having a grand trine in water if you’re into astrology. 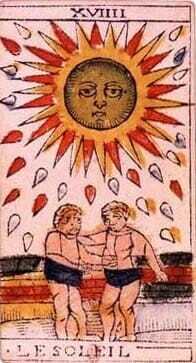 The nine and ten of cups cards are like the Sun, happy people surrounded by that pervasive hue. Even the rainbow, as you can see above in the ten, is perverted with it to represent sunlight, substituting the inner violet ring with that color. I mean the rainbow is enhanced with it, of course. 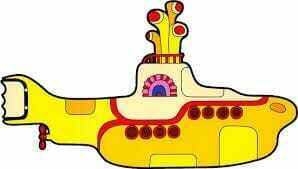 “They call me mellow (that color),” says Donovan, “quite rightly.” Well, me personally they don’t call that. It’s hard being phobic about something everyone considers wonderful. These three y-colored cards represent happiness, joy, youth, goodness, health, wealth and all the good things in life. Shudder. “Please,” says Barbra, “don’t rain on my parade.” Well, I shrug wistfully, some things I just can’t seem to help. I hope you can stay onboard with me, or at least live next door. 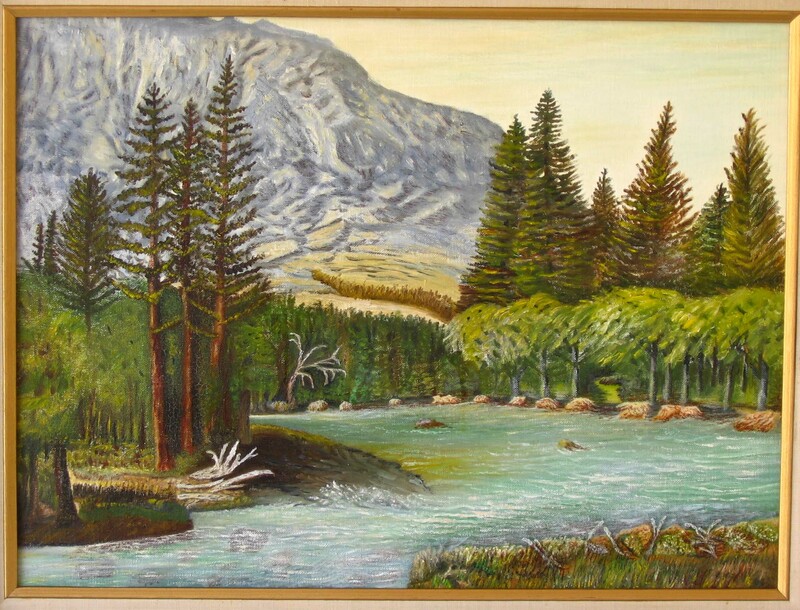 The painting is by my grandmother, Blanche Stephens, 1979. The Nine of Cups if from the Gummi Bear deck. 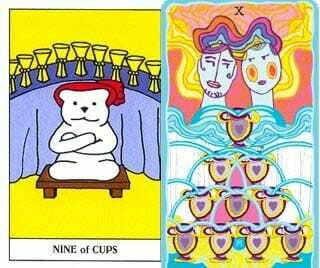 The Ten of Cups is from the Sakki Sakki deck. The Sun is from the Jean Dodal deck.